Edith Howard, 69, Homemaker, died on Sunday, December 23, 2018 at her residence in Dunnellon. She was born on October 6, 1949 in Spangler, PA and was the daughter to the late Earl Cence and Edith Yeager Cence. Edith moved to Dunnellon in 2000 from North Carolina. She enjoyed gardening, bird watching and most importantly spending time with her family. She will be greatly missed by all her family and friends. Those left to cherish her memories are her step-daughter, Angela Howard, Citrus Springs, FL; her brother, Gary Cence (Diane), Avon, OH and her granddaughter, Abigail Howard. She is preceded in death by her husband Johnny Howard. Funeral Services will be held on Wednesday, December 26, 2018 at the Roberts Funeral Home of Dunnellon at 11:00 AM. 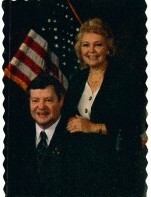 Edith will be laid to rest at the Florida National Cemetery in Bushnell beside her husband, Johnny.